Thirteen car bombs exploded around Iraq on Sunday, including eight in Baghdad that detonated within a three-hour window, as insurgents continued their attacks in the new year. The bombs injured at least 20 people but killed no one, police said. A Sudanese official on Sunday said six kidnapped employees had been released two days after Sudan announced it would close its embassy in Baghdad, meeting kidnappers' demands. A Cypriot man kidnapped four months ago also was released after his family paid a ransom, a relative said. Two more U.S. soldiers were killed in Iraq as the year wound down Friday, putting the American military death toll at 841 so far, just five short of 2004's lost lives despite political progress and dogged efforts to quash the insurgency. "American Idol 3" star Diana DeGarmo and other entertainers treated hundreds of U.S. forces in Baghdad to a New Year's Eve show on Saturday. The performers were traveling with the chairman of the Joint Chiefs of Staff Gen. Peter Pace as part of a six-nation holiday tour to thank the troops. Also in Baghdad, hundreds of cars lined up at gas stations as word spread that Iraq's largest oil refinery shut down two weeks ago because of threats of insurgent attacks. Nearly three years after the U.S.-led invasion, a fuel crisis again threatens to cripple a country with the world's third-largest proven oil reserves. CBS News correspondent Kelly Cobiella. In Baghdad, the first car bomb exploded at about 8:15 a.m. as Iraqi army soldiers were patrolling a northern neighborhood, wounding two soldiers, police Lt. Bilal Ali Majid said. Seven more car bombs exploded over the next 2½ hours, wounding a total of nine people, police said. One suicide attacker died. Police later detonated a ninth car bomb in a controlled explosion. Just north of Tikrit, 80 miles north of Baghdad, a suicide car bomber detonated his car near an American patrol, injuring six civilians, police 1st Lt. Ali Jasmin said. Iraqi police had no information on American casualties and U.S. officials had no immediate information. Two car bombs also exploded in Kirkuk, 180 miles north of Baghdad, including one that targeted an American convoy, police Brig. Sarhat Qadir said. U.S. officials had no immediate information on possible casualties. 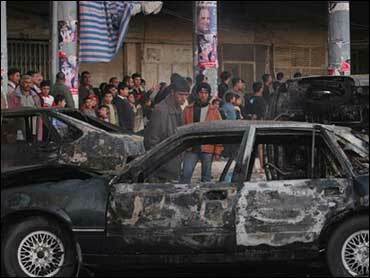 The second bomb targeted a police convoy, wounding three civilians, Qadir said. In Muqdadiyah, about 60 miles north of Baghdad, a car bomb targeting an American patrol exploded, and the Diyalaa police said there may have been Americans casualties; U.S. officials had no immediate comment. In other violence Sunday, about a dozen gunmen attacked a police checkpoint in Mosul, killing one bystander and injuring three policemen, police Brig. Saed Ahmed said. U.S. Brig. Gen. Donald Alston on Sunday said officials had expected attacks to increase after the security measures put in place for the Dec. 15 parliamentary elections were relaxed. "We're seeing that increase right now," he said. "This is perceived, inappropriately I would say, or inaccurately perhaps, by the enemy as a time of vulnerability as the government transitions ... to a permanent government." The six kidnapped employees of Sudan's embassy were released on Saturday, a Sudanese official said. "We talked to the six of them by phone and they told us that they are now at the house of one of their friends," said the Sudanese embassy's charge d'affairs, Mohamed Ahmed Khalil. The Sudanese Foreign Ministry reported on Dec. 24 that six of its embassy employees had been kidnapped — including the mission's second secretary. Al Qaeda in Iraq had set a Saturday deadline for Sudan to "announce clearly that it is cutting its relations" with the Iraqi government, or it would kill the hostages. Sudan said Friday it would close its embassy in Baghdad in an effort to win their release. The terror group has kidnapped and killed a string of Arab diplomats and embassy employees in a campaign to scare Arab governments from setting up full diplomatic missions in Iraq. In July, al Qaeda abducted the top Egyptian envoy in Baghdad, Ihab al-Sherif, and two Algerian diplomats. It later announced they had been killed. The group also snatched two Moroccan embassy employees in June and said that it had sentenced them to death, though it never stated whether it carried out the sentences. Garabet Jekerjian, 41, who holds both Cypriot and Lebanese citizenship, was kidnapped by gunmen in Baghdad in August. His brother, Avo Jekerjian, told The Associated Press that he was released in Baghdad Saturday after a ransom of $200,000 was paid to the kidnappers. Jekerjian had worked for Geto Trading Ltd., a Cyprus-based company supplying food and alcoholic drinks to U.S. forces. Islam prohibits consumption of alcohol. His brother said the company contributed to the ransom, but he would not say how much. On Saturday, at least 20 people were killed in a series of bombings and shootings. A U.S. soldier also died from wounds Saturday from a mortar attack in Baghdad, the military said, putting the American military death toll in 2005 at 841 — five short of 2004's record total despite political progress and dogged U.S. and Iraqi efforts to quash the insurgency. A total of 846 troops died in 2004 and 485 in 2003. Iraq's electoral commission, meanwhile, repeated a call Saturday for the country's political groups to remove from their tickets 90 former members of Saddam Hussein's Baath party before it issues final election results this week.